The Roman Senate issued coins on this occasion bearing the following inscription: ARMENIA ET MESOPOTAMIA IN POTESTATEM P.R. 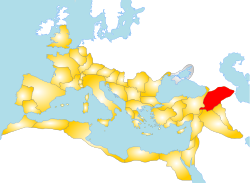 REDACTAE, thus solidifying Armenia's position as the newest Roman province. A rebellion by the Parthian pretender Sanatruces was put down, though sporadic resistance continued and Vologases III of Parthia managed to secure an area of south-eastern Armenia just before Trajan's death in August 117. Armenia was in frequent dispute between the two empires and their candidates for the Armenian throne, a situation which lasted until the emergence of a new power, the Sasanians. 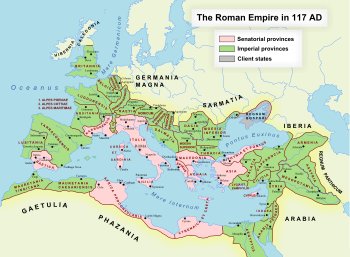 Rome's power and influence increased over the years since, but Armenia retained its independence, even if only as a vassal state, although it a Roman ally against the Sasanian Empire. When Roman emperor Septimius Severus sacked the Parthian capital of Ctesiphon, many Armenian soldiers were in his army. Later in the 4th century, they consisted of two Roman legions, the Legio I Armeniaca and the Legio II Armeniaca. In the second half of the 3rd century, the Sassanid capital of Ctesiphon and areas of southern Armenia were sacked by the Romans under Emperor Carus, and all Armenia, after half a century of Persian rule, was ceded to Diocletian in 299 as a vassal territory. The Satrapies (Latin: Gentes) in the south on the other hand, which had been under Roman influence already since 298, were a group of six fully autonomous principalities allied to the Empire (civitates foederatae): Ingilene, Sophene, Antzitene, Asthianene, Sophanene and Balabitene. The local Armenian nakharar were fully sovereign in their territories, and were merely required to provide soldiers upon request and to dispatch a golden crown to the emperor, as a token of submission. In return, they received their royal insignia, including red shoes, from the emperor. In 591, the treaty between Khosrow II and Maurice ceded most of Persarmenia to the Eastern Roman Empire. The region was the focus of prolonged warfare in the Byzantine–Sasanian War of 602–628. After the onset of the Muslim conquests and the Arab conquest of Armenia, only the western parts of Armenia remained in Byzantine hands, forming part of the theme of Armeniakon. Armenia remained dominated by the Arabs thereafter, and was ruled by a succession of Caliphate-appointed emirs as well as local princes. Apostle Bartholomew is said to have been executed in Albanopolis in Armenia. According to popular hagiography, the apostle was flayed alive and beheaded. According to other accounts he was crucified upside down (head downward) like St. Peter. He is said to have been martyred for having converted Polymius, the king of Armenia, to Christianity. Enraged by the monarch's conversion, and fearing a Roman backlash, king Polymius's brother, prince Astyages, ordered Bartholomew's torture and execution, which Bartholomew courageously endured. However, there are no records of any Armenian King of the Arsacid dynasty of Armenia with the name Polymius. Current scholarship indicates that Bartholomew more likely died in Kalyan in India, where there was an official named Polymius. Armenia became the first country to establish Christianity as its state religion when, in an event traditionally dated to 301, Gregory the Illuminator convinced Tiridates III, the king of Armenia, to convert to Christianity. It is a well recognized historical fact that the Armenians were the first nation in the world to formally adhere to Christianity. This conversion was followed in the 4th and 5th centuries by a process of institutionalization and Armenization of Christianity in Armenia. Indeed, Gregory the Illuminator became the organizer of the Armenian Church hierarchy. From that time, the heads of the Armenian Church have been called Catholicos and still hold the same title. St. Gregory chose as the site of the "Catholicosate" the capital city of Vagharshapat (actual Ejmiatsinin) in Armenia and built there the Etchmiadzin Cathedral as a vaulted basilica in 301-303 (Vahan Mamikonian, Roman governor of Armenia, in 480 ordered the dilapidated basilica to be replaced with a new cruciform church, still standing in the modern Armenia). ^ (in Armenian) Hakobyan, Tadevos Kh. «Մալաթիա» [Malatya], Armenian Soviet Encyclopedia. Yerevan: Armenian Academy of Sciences, 1981, vol. vii, p. 145. Garsoïan, Nina G. (1998). "Aρμενία μεγάλη καὶ ἐπαρχία Μεσοποταμίας". ΕΥΨΥΧΙΑ. Mélanges offerts à Hélène Ahrweiler (in French). Paris: Éditions de la Sorbonne. pp. 239–264. ISBN 9782859448301. This page was last edited on 24 March 2019, at 00:07 (UTC).